Chicken Ampalaya is a quick and easy recipe for ampalaya lovers. 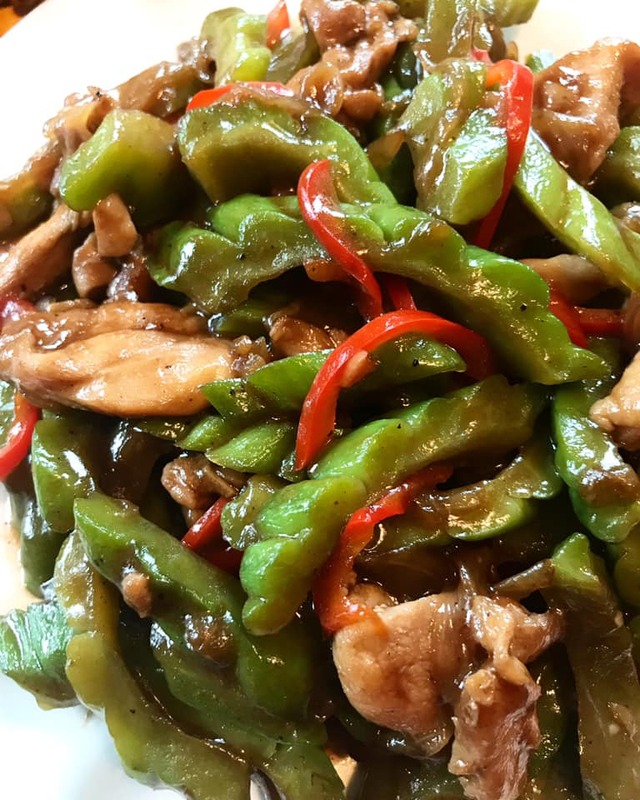 This Chicken Ampalaya is cooked in oyster sauce, soy sauce and hoisin sauce. It is so delicious and nutritious. Ampalaya or Bitter Melon also known as Bitter Gourd has always been my favorite vegetable since I was a teen. It is the bitterness of this vegetables and all the amazing health benefits. Do you know research shows Ampalayas health benefits includes managing blood sugar and treating diabetes, enhancing body immunity, helps sharpen vision, relieving asthma, enhance skin and treat skin condition? It also plays role in cancer prevention, reduce cholesterol levels, promoting bone health and promoting weight loss and good digestion. 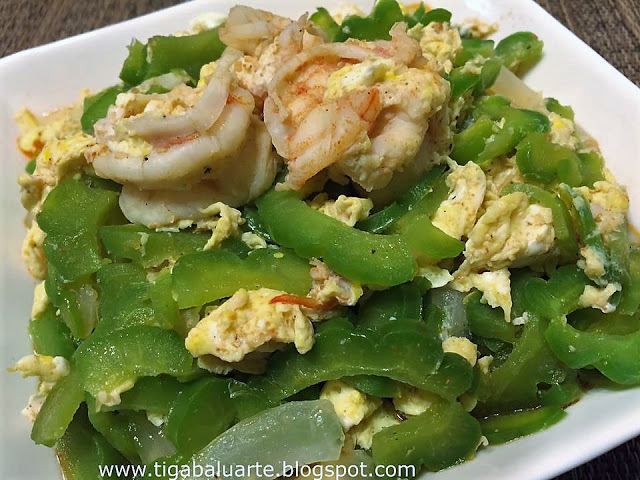 Hubby is kinda tired of the common Ginisang Ampalaya cooked in shrimp and egg so I figure why not make something else. 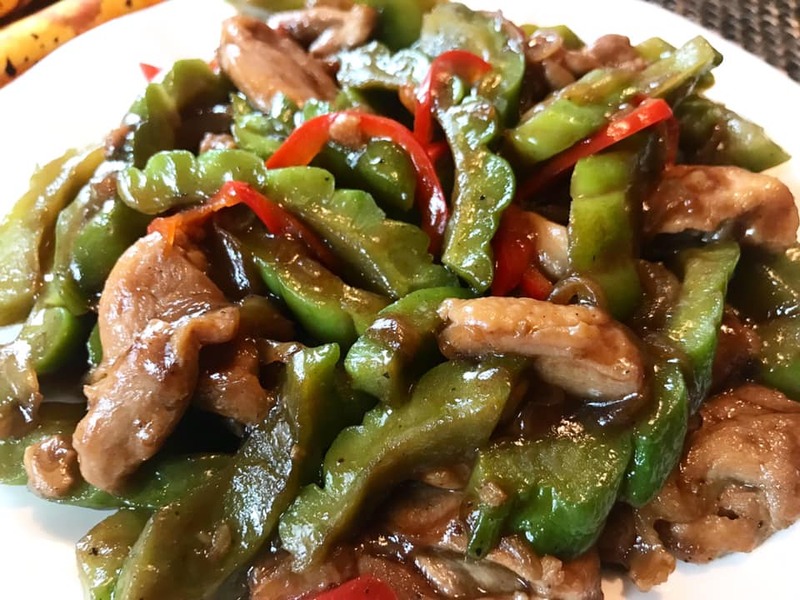 With this Chicken Ampalaya dish, I added thin slices of red bell pepper and minced ginger and it turned out really good. 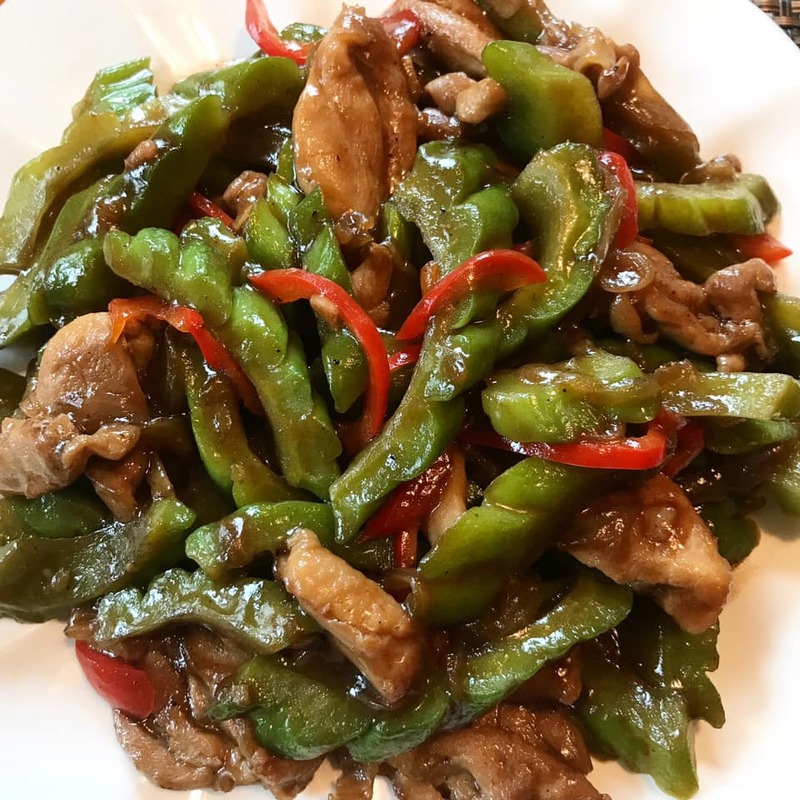 This Chicken Ampalaya recipe is almost the same as Ampalaya con Karne which is ampalaya cooked in thin slices of beef with tausi or salted black beans. 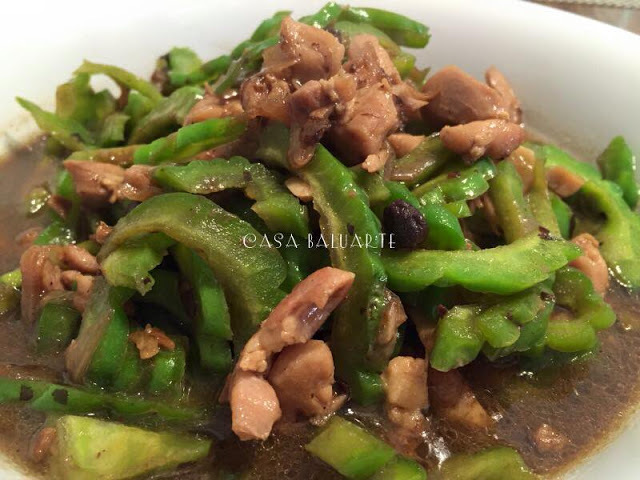 If desired, you can use pork or beef instead of chicken in this recipe. So simple and easy to make. Give it a try and share with friends and family. Check related ampalaya recipes below by clicking on the name link below the picture to see complete recipe(s). Cut ampalaya into 1/2 inch thin. Rinse in water and drain. In a bowl, combine soy sauce, hoisin sauce, oyster sauce, sesame oil, sugar, ground pepper, cornstarch and 3 tablespoon water. Stir well to combine and set aside. Using a wok or a wide pan, heat over medium and add cooking oil. Add onions, garlic and minced ginger. Stir and cook for 1 minute or until aromatic. Add chicken slices and stir. Cook for 2 minutes or until golden brown. Add 1/2 cup of water and stir. Cover wok and simmer for 10-15 minutes or until chicken is fully cooked. Add slices of ampalaya to the wok and gently stir. Allow ampalaya to cook for 3-5 minutes or until tender yet crisp. 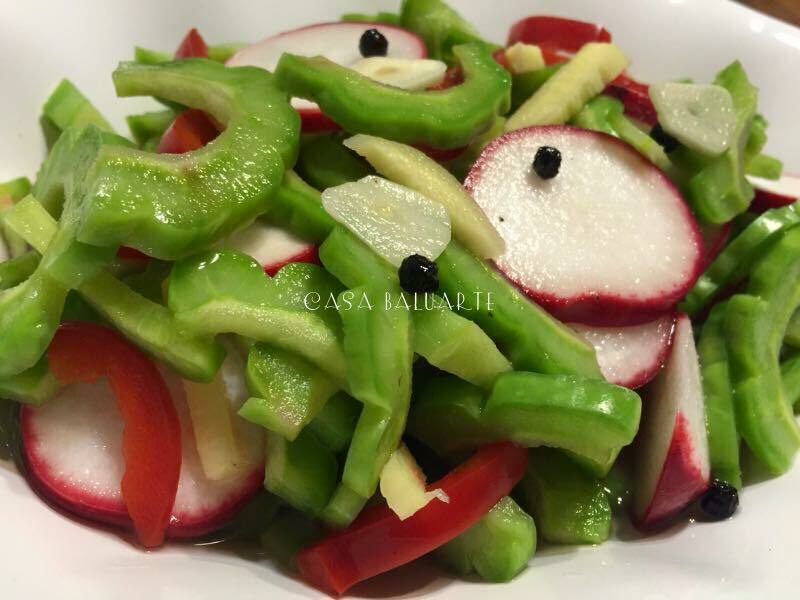 Add slices of bell pepper and stir gently. Cook for a minutes. Pour in soy sauce-cornstarch mixture and gently stir. Continue cooking for about 2 minutes until sauce slightly thickens. Taste to see if salt is needed. Transfer in a serving plate and serve hot with rice. Enjoy!